I wouldn't normally post something about a TV show on my gaming blog but the relaunch of the BBC's Top Gear in the UK with Chris Evans at the helm was so awful that I felt I just had to talk about it...mainly to get the disappointment out of my system. Chris Evans shouts his head off. Guy races a silly buggy thing over a little dune while shouting his head off. Sabine Schmitz shows the guys that it's possible to drive ridiculously fast without shouting your head off. It came across as the Chris Evans show with a few others thrown in for the sake of it. Given that Chris Evans is arguably the most annoying person on the BBC's books at present, that was probably not such a great plan. 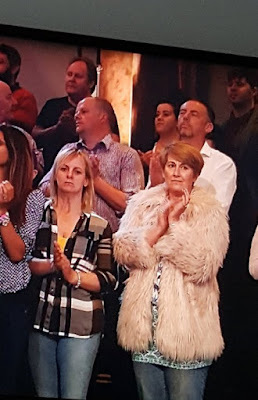 Apart from that, some of the studio audience, apparently, walked out during filming when it over-ran it's alloted time and after being shouted and sworn at by Chris Evans when they failed to laugh at the jokes after many many out-takes. Here's a photo of the audience that remained...obviously thoroughly enjoying the show. It appears that someone told them when to clap but forgot to warn them that they also needed to smile at the right times. Before any of this even happened, they had a problem when the shows executive producer, Lisa Clark, walked out. That, to any organisation that had to use its own money rather than sponging off taxpayers, would have been a clear alarm bell. The problems with Chris Evans didn't stop there. He, apparently, crashed a brand new Jaguar on the test track on his very first drive, he was sick as a parrot when Sabine took him for a drive on a track in an Audi and, as it turned out, he's incapable of talking while driving - or at least remembering what the heck he's supposed to be talking about...something rather important for the lead presenter of a car show, you'd have thought. He started the show by mimicking (poorly) Jeremy Clarkson and continued to do so throughout. This was supposed to be a launch of a brand new Top Gear. Instead it was a akin to a poor tribute band following in the footsteps of their heroes and failing miserably. I saw a comment somewhere that Sabine was seen in the studio staring askance at Chris Evans' antics. I can only imagine what was going through her mind...it probably included a ten foot spike. And why do they think they need seven, yes SEVEN, presenters to do what four did far better before? My view is that they should keep Sabine who was calm throughout, knows about cars and is a damn good driver (also looks great but that's not very PC! ), keep Matt LeBlanc who was a bit excitable but still pretty good as a presenter and keep Chris Harris who knows a lot about cars and also knows how to drive the things. The rest of the bunch should be unceremoniously dumped. They should rename the show to something else and change the format. There's no point trying to flog the Top Gear horse, it's dead and buried. The BBC ruined it, now they need to deal with the consequences. I'm not the only one who feels it was a bit of a farce. Fans dubbed the new show Flop Gear on twitter and other social media. Seems that when the show aired across the Atlantic, it received a similar reception. People are now placing bets (with massively reduced odds) of this being Top Gear's last season. Phew. I feel better now...albeit still rather sad for what happened to Top gear.